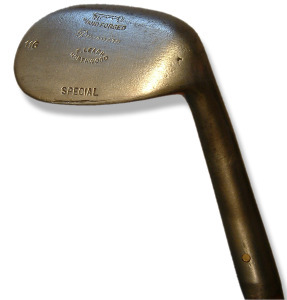 Call it beginner’s luck… This was the first hickory golf club I bought in July 2011 for $28 via eBay from dealer Arlie Morris in California (see below). As a beginner, I had no idea what I was looking for and nearly every club held some appeal to me. I was curious to know what a smooth face club was like, and I feel fortunate to have selected this one. Today, it is the one club with which I never wish to part. At 48-degrees, the niblick is superlative from heavy rough and – for me – it’s a stock 90-yard club. With a miraculously stout shaft and heavy club head, this is a workhorse that can withstand any force applied to it. And, for those of you who assume there can be no backspin with a smooth faced club; that’s not the case. This niblick has a deep face which imparts some backspin following a descending blow. I merely wish I knew its travels in the last 100+ years. 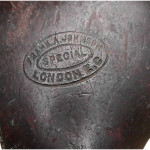 Part of the attraction of this club is the brilliant stampings and the visible seam on the back of the club directly underneath the stamp, “SPECIAL” as seen in the photo at the top. 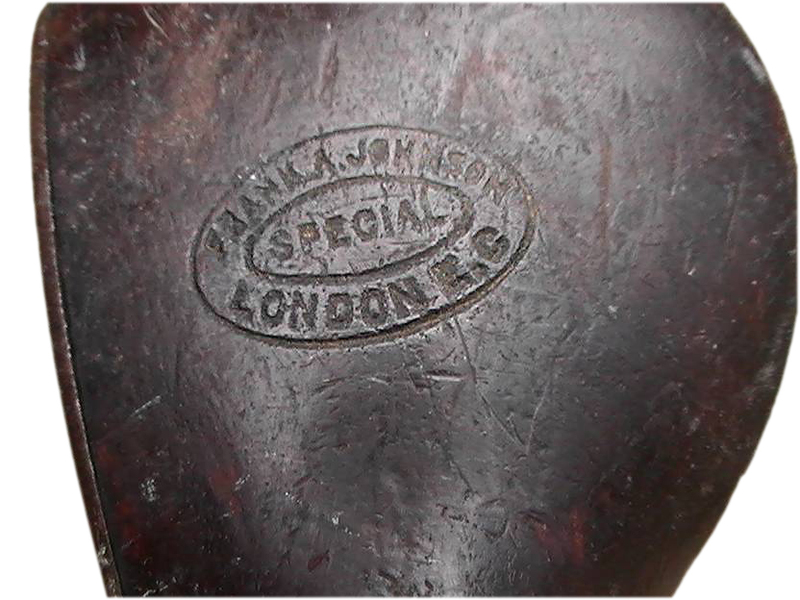 With £50 of borrowed money, Frank Alexander Johnson opened his business at 29 Paternoster Row in London in the early 1900s. 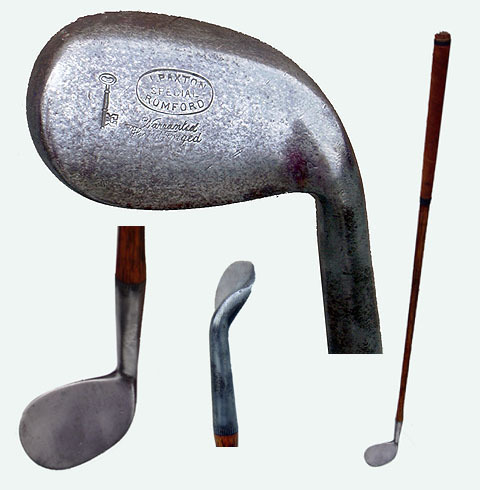 An inventive club maker, he was not so successful in business or perhaps just illustrated the problem of smaller limited companies versus family operated enterprises in the golf market, a topic often discussed in the press at the time. He is known for his Cygnet series of anti-shank irons and for the Premier range of clubs. A cleek mark of a key identifies his clubs. Clearly he was under-capitalized and tried expanding too quickly. As soon as his profits reached £500 per annum he opened branches in Glasgow and Birmingham yet, at the same time, he was drawing a salary of £500 as managing director. In 1909 he attempted to raise £10,000 by means of a flotation yet this only realized £850 when he converted his business to Frank A Johnson Ltd. Still he pressed on with expansion. He brought in Hugh Logan to manage the London club making operation in 1910 but, a year later, the business failed with debts of £17,000. £14,000 of his final debt was owed to Hutchison Main and there is a further footnote in history for Frank Johnson as, when Hutchison Main also went into liquidation in 1913, the ownership of his debenture in their favor was fiercely contested between the liquidators and the Bank of Scotland, the Bank taking the case all the way to the House of Lords (and losing) [Bank of Scotland v Liquidators of Hutchison, Main and Co, Limited, 1914]. Johnson also notably sold golf gloves as early 1901 (for those who feel wearing gloves in hickory golf is historically inaccurate). The following is a display ad from Golf Illustrated, January 25, 1901. Golf professional Fred Leach joined the UK PGA in 1902 and served numerous clubs until 1950. He apprenticed at Northwood Golf Club in 1904 and 1905 before assuming his full-time position there from 1906 through 1924. Northwood lies Northwest of London just a few Tube stops from Wembley. The Club was founded on April 25, 1891 as a nine hole golf course on the same site where it stands now. The land was then known as The Gravel Pits. In 1920 the Club bought the freehold of the land and extended the course to eighteen holes. Arlie was born in a log cabin on December 29, 1934, in the Township of Merion, Missouri, to Arlie Dea and Margie McIntosh Morris. As a young boy, he moved with his parents to Southern California. When he was eight, his family moved to Visalia where he started puttering around with a couple of old hickory clubs in a nearby vacant lot, burying tomato cans in the dirt for cups. It was clear at this young age that he was interested in golf. The family moved several times during his teenage years. After graduating high school, he attended Pepperdine College where he worked toward a degree in Chemistry. In l958, he married Donna Mae Brown with whom he had two daughters. While working as a chemist in a lab, he discovered that he didn’t like being confined indoors so the family moved to Delano where Arlie sold insurance for Prudential. A friend invited him to play golf at Sierra View one day and bet him that he couldn’t break 100. Well, Arlie shot 98 and said that when he walked into the pro shop that day, he just knew it was where he belonged. He quit his job in Delano and then he and his father opened an auto repair shop in Visalia where Arlie worked nights and improved his golf game during the day. Eventually, Ralph Lomeli, the pro at Sierra View Golf Course, hired him as an assistant pro. After a few years, Ralph took over the municipal course in Porterville and brought Arlie with him. Within a year, Ralph went back to Sierra View, but Arlie stayed in Porterville. He then earned his PGA Class A card and was the Head Pro at Porterville Golf Course for the next 32 years. One of his proudest accomplishments was the junior program he ran each summer. He taught hundreds of kids to play golf over the years and took pride in watching them grow up enjoying the game In 1973, Arlie met and married Barbara Owen Funderburk who worked with him at the golf course until their retirement in 1996. They became interested in collecting and playing antique wood-shafted golf clubs, and traveled around the U.S. to participate in hickory shows and tournaments. Arlie won the Senior National Hickory Championship 5 times and was the Region 9 Director for the Golf Collectors Society for 6 years. Arlie was a patient and enthusiastic advisor for a novice like me and I had the good fortune to purchase many of my first clubs from him. He passed away in 2014 and has had a large impact on a great number of hickory players.